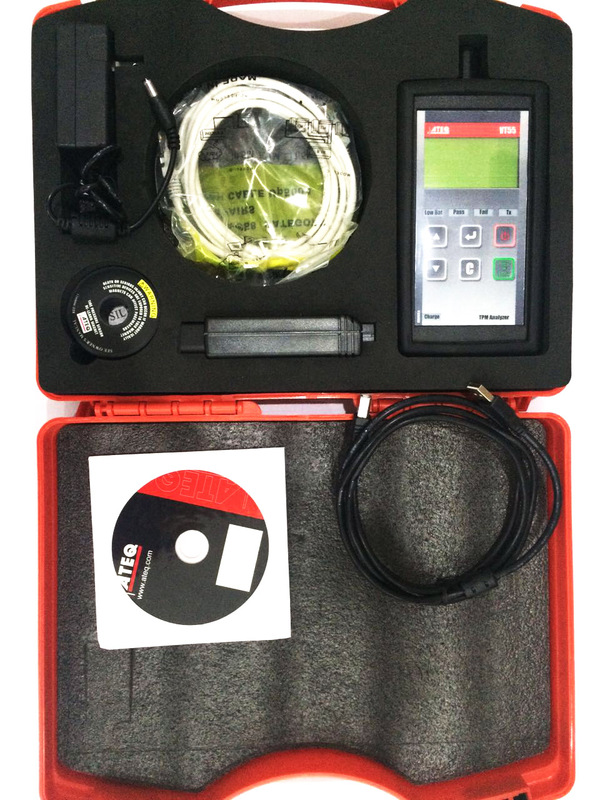 ATEQ Corporation introduces another innovative product that will make professional TPMS service quick and easy. For vehicles requiring an OBDII relearn, ATEQ’s VT55 OBDII kit includes a universal OBD connector which interfaces with the vehicle’s ECU via CAN bus or K-line. Service technicians only have to select the make of the vehicle, trigger the tire sensors and transfer the IDs, says the company. In addition to all U.S.-manufactured vehicles, the ATEQ VT55 OBDII reprograms Asian or European vehicles (including Toyota, Honda, Nissan, Hyundai, Kia, Subaru, etc. ), which do not feature a TPMS “learn mode.” It’s just that easy and fast to accurately activate and decode TPMS sensors, and display data or any sensor faults. Training is not needed as the entire step-by-step process is displayed on the large, easy-to-read screen. Even the newest technician can use the VT55 OBDII Kit right out of the box. The ATEQ VT55 is a continuously evolving tool thanks to software updates adding functionality, features and user-friendliness while keeping the same hardware. There’s no need to buy a new tool because there are new sensors on the market or new features available. 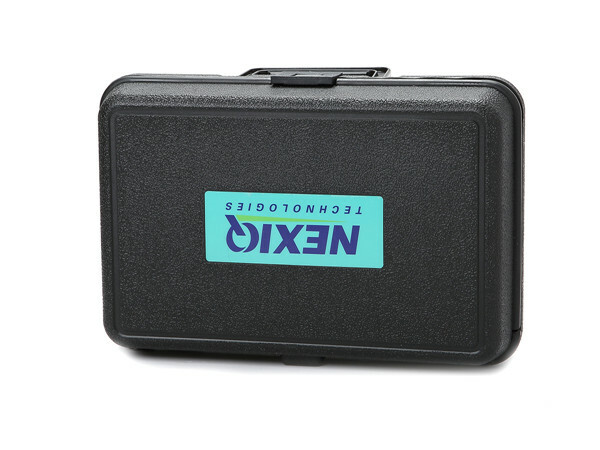 Everything needed to get started and complete service is included in a convenient, heavy-duty case: the VT 55 OBDII tool, USB cables, PC Driver, software and instruction booklet. ● Power Supply: Li-Ion rechargeable batteries with charger featuring low battery status. ● Displays: Depending on the information transmitted by the sensor, the VT55 will display sensor ID, pressure, battery state, temperature and accelerometer information. ● Indicators: LEDs: low battery, transmission, PASS and FAIL. Buzzer. ● Radio Reception: 2 frequencies: 315 MHz and 433.92 MHz. The VT55 can also test a RF Remote Keyless Entry system. ● Weight: 250 g (8.82 ounces). ● Connectivity: USB port with included USB cable, PC driver and software. ● New Sensor Upgrades: Free for one year. 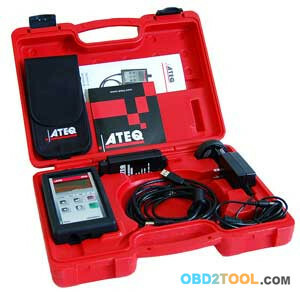 For more information about ATEQ TPMS tools, contact Eri Muca at sales@obd2tool.com or visit www.obd2tool.com. VT55 OBDII TPMS diagnostic tool from Obd2tool.com. The best way to turn the tire warning light OFF ! On top of the US manufactured vehicles, the ATEQ’s VT55 OBDII reprograms Asian or European vehicles (including Toyota, Honda, Nissan, Hyundai, Kia, Mitsubishi, etc) which do not feature a TPMS self reprogramming software.VT55 OBDII kit includes a universal OBD connector which connects to the vehicle ECU via CANbus and K-line. 1.Blow Out Sale! Normally $1199!! * Displays: Depending on the information transmitted by the sensor, it will display sensor ID, pressure, battery state, temperature and accelerometer information. 2.Indicators: LEDs: low battery, transmision, PASS and FAIL. Buzzer. 3.Connectivity: USB port with included USB cable, PC driver and software. 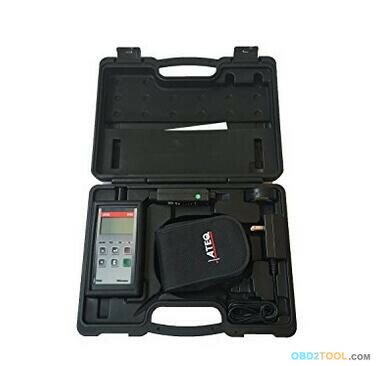 *Get your hands on a brand new Professional Diagnostic Tool VT55 kit at a Never Before Seen price* If you miss this, you WILL kick yourself! 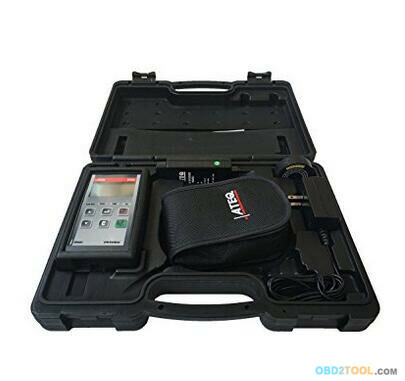 Includes: VT55 Tool Molded Case OBDII Tool and cable Magnet CD ATEQ’s VT55 OBDII TPMS decoder / activator The best way to turn the tire warning light OFF! In addition to US manufactured vehicles, the ATEQ VT55 OBDII reprograms Asian and European vehicles including Toyota, Honda, Nissan, Hyundai, Kia, Subaru etc, which do not feature a TPMS “learn mode”. So you found a great deal on a NEXIQ Technologies 125032 USB-Link from www.obd2tool.com. Sounds great! Hey that $50 savings is a steak dinner, so what if the product has a 3-4 week delivery, if it is $50 off the deal. ? While you are ordering the USB-Link go ahead and grab yourself a Rolex watch. it is even a better deal! As with the late model original USB Links, Nexiq is now supplying a very long 6/9 pin connector. It is roughly 3 long. Our assumption for this design change is that on the previous models with the short connector, it would sometimes cause the adapter to hang in a location that could cause it to be damaged if the door of the cab was closed on it. This new model also includes the standard 15 USB cable. 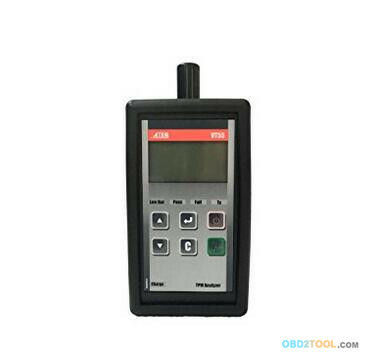 ATEQ VT55 OBDII TPMS is a universal TPMS sensor activator that can also program the vehicle ECU, if required. Compatible with all currently known TPMS sensors, it has a built in synchronization software which ensures that it stays up-to-date with all the new TPMS sensors introduced every year. Designed to last in forceful environments like tire repair shops, the VT55 OBDII can handle high volume testing throughout the day due to its rechargeable battery. The VT55 OBDII is equipped with the latest advanced stream decoding technology that can trigger and decode sensors much faster and more accurately than previous generation devices. ATEQ’s VT55 OBDII is a universal TPMS sensor activator that can also program the vehicle ECU, if required. Compatible with all currently known TPMS sensors, it has a built in synchronization software which ensures that it stays up-to-date with all the new TPMS sensors introduced every year. Designed to last in forceful environments like tire repair shops, the VT55 OBDII can handle high volume testing throughout the day due to its rechargeable battery. The ATEQ VT55 OBDII TPMS is equipped with the latest advanced stream decoding technology that can trigger and decode sensors much faster and more accurately than previous generation devices. TPMS Support : vt55 ateq is one of the largest companies in the TPMS industry. ATEQ can supply and service our products all over the world thus providing excellent service standards to our customers. Having a global advantage in the market enables ATEQ to guarantee customer satisfaction in both the quality of the instrument and the level of service and technical support our customers need. Reference customers :Reference TPMS customers include: Ford, GM, Chrysler, Toyota, Nissan, Suzuki, Honda, Mitsubishi, Mazda, Subaru, Hyundai, Kia, Samsung, Daewoo, Renault, Peugeot, Ferrari, Citroen, Iveco, Land-Rover, Volskwagen, BMW, Mercedes, Audi, Fiat, Schrader, TRW, SmartTire, Continental and Siemens.